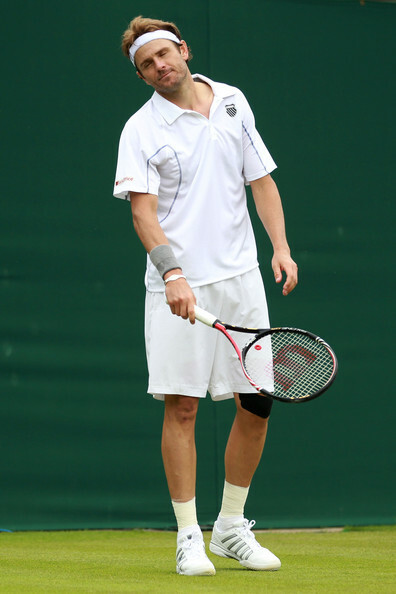 We have already talked about Nike fashion at Wimbledon. Let's see what Adidas has to offer. Adidas created three lines for this year Wimbledon. And all their clothing has also a version in color, so it will probably be used during U.S. Open as well. Ana Ivanovic and Daniela Hantuchova presented us a dress from Adidas adiZero Feather line. Adidas adiZero Feather dress is also available in pink and blue. We will probably see it at U.S. Open, but these colors are already on sale in major tennis stores. Other lines include Adidas Pure featured by Flavia Penetta, and Adidas Barricade. Read about Adidas men's collection in our next post. For Vera Zvonareva 5 seems not to be a lucky number. Today she lost to Tsvetana Pironkova in two sets. 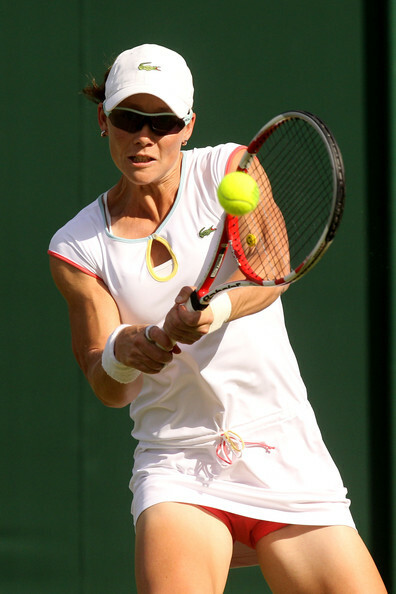 In terms of fashion, Vera introduced us to what Californian company K-Swiss offers for its 2011 Wimbledon tennis collection. 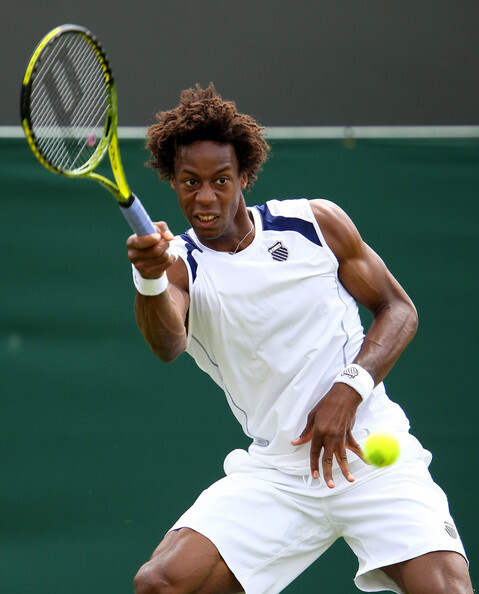 Other K-Swiss-sponsored athletes include American Mardy Fish and French Gael Monfils. 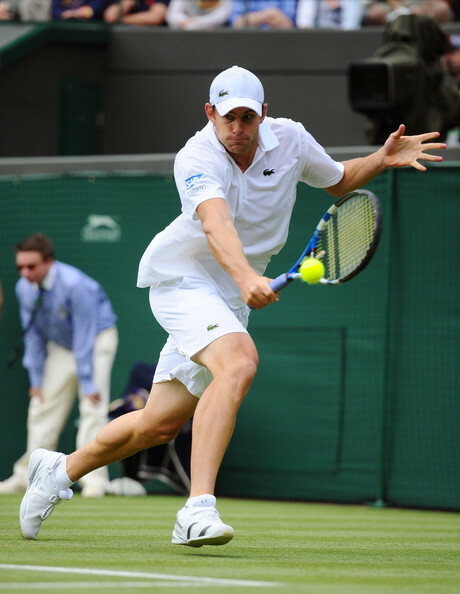 And as we see, K-Swiss goes for white-navy combination in all of its Wimbledon clothing. Top players keep surprising us loosing early in the tournament. 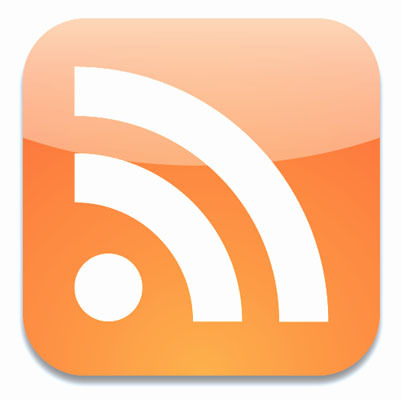 This time Chinese tennis superstar Li Na didn't make it to the fourth round being defeated by the German Sabine Lisicki. 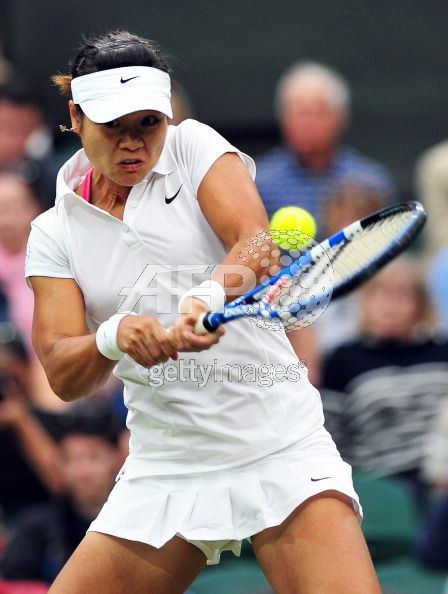 In terms of tennis fashion, Li Na already received our appreciation for a cute Nike ensemble she chose for this year Wimbledon. It goes without saying, pleated skirt is a tennis classics of all time. Roger Federer's friend and doubles partner Stanislas Wawrinka from Switzerland didn't make it to the third round of Wimbledon loosing to the Italian Simone Bolelli in straight sets. Though Stanislas didn't play well today, he looked amazing in this Lacoste outfit. Little blue accents on Lacoste Tipped Polo Shirt made it classy and much more interesting than all-white combination Andy Roddick went for. Wearing the same Lacoste dress we saw on Dominika Cibulkova during the Sony Ericcsson Open in Miami, but in white, Samantha isn't the first one who "scandalized" Wimbledon wearing red underpants. Four years ago, another Lacoste sponsored athlete, Tatiana Golovin, shocked British public by wearing red shorties. The Wimbledon 2011 has arrived! And while it's a little bit challenging to judge the Wimbledon's fashion because of the "all-white" rule, we decided to compare what styles were offered by different brands this year, and how they were able (if were) to differentiate themselves in the white tennis cloud. 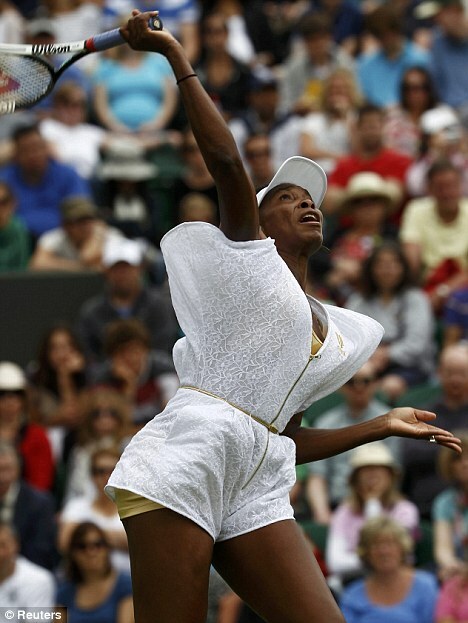 "The white onesie was so short you could clearly see the golden hotpants she was wearing underneath every time she bent forwards during the match. It also had a curiously baggy, and very unflattering top-half, which made her chest look saggy as she ran around the court". We can't describe it any better. 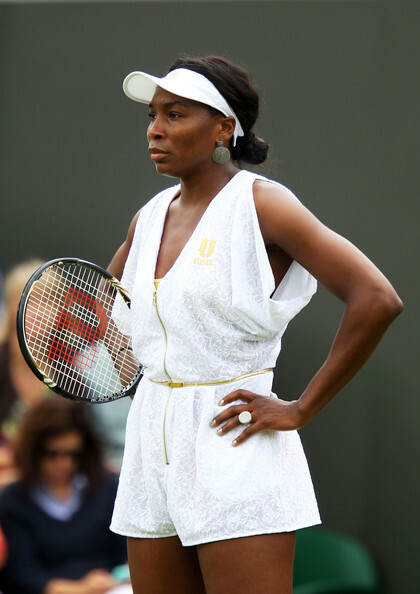 Do you like Venus Williams' Wimbledon outfit? With an overabundance of tired tennis styles, we have come across a website that sells current and comfortable looks for all athletic women, not just tennis aficionados. Check out Athleta.com! They offer great tennis apparel for ladies – take a look at these easy dresses with built-in bras and adorable peek-a-boo cutouts. This is the Impact Bra Cup Dress and the Printed Momentum Bra Cup Dress - two sleek and stretchable styles that definitely dress up the tennis court! Available in a variety of colors, these tennis dresses are fabulous! Athleta also offers the Athleta Big Shot Tennis Shoe from K Swiss. The fit on this shoe is 20 percent closer to the tennis court and a bit wider than the best-selling tennis shoes available! Built to endure even the toughest tennis match, the Big Shot Tennis Shoe features an abrasion-resistant outsole for gripping traction with a six-month wear guarantee! Oh, and we forgot to mention…they are great-looking and pair well with all the sporty Athleta tennis styles. Also available from our friends at Athleta, the Victory Visor , Morning Run Cap and Pilayo Zippy Headband featured below make attractive and functional accessories for gals who like to focus on their game. Available in a variety of colors, the visor and cap both offer 360° reflectivity if worn for an early morning or early evening run, to ensure visibility. The headband cleverly features grip tape on the inside to keep even the most unruly hair strands in place. It is just one of several trendy headbands available from Athleta. Check out other cool accessories like water bottles , sports watches , sunglasses and moisture-wicking socks ! You’ll find everything you need for all your active pursuits.